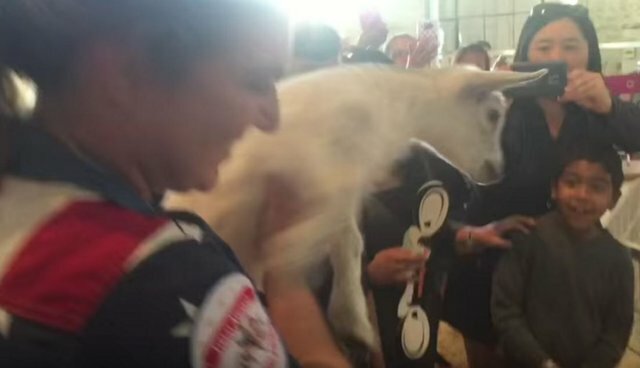 The search for a baby goat stolen from the Arizona State Fair lasted 20 hours. He was only three-and-a-half weeks old when he went missing from the petting zoo. At just 5 pounds, he was small enough to be smuggled out inside a jacket. That makes it all the more miraculous that a man walking his dog should spot the tiny pygmy baby goat in a ditch. He appeared to have been discarded there, but Gus Gus was alive and well. Happy may be a bit of a understatement. It's not often we see a rescued animal, squirming and bucking and trying to kick free of the person who saved her.